Size including the bail: 1" x 1/2" (2.5 x 1.5cm) | Gift boxed with FREE 18" Sterling Silver matching chain. 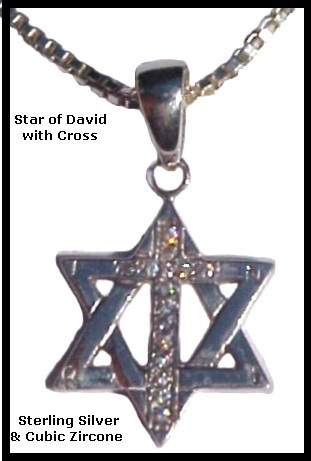 Delicate and beautiful '925' Sterling Silver Star of David with Cross. The Cross is accented with brilliant CZ stones - Conveying the Message. ~ A great gift for woman of all ages. Ancient tradition combined with original modern art. Quality Jewelry you will treasure! Beautiful personal keepsakes that will be cherished forever. You will love this combination - Attesting the Messianic Message. Messiah is the English translation of "Mashiach", the Hebrew word meaning "Anointed". The name Christ comes from the Greek "Xristos" (The "Anointed"). "Messianic" (Messiah /Mashiach): Christian and Jewish groups who adopt certain Jewish practices in order to live out an earlier, purer, form of Christianity. 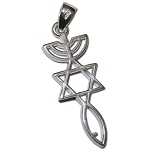 The Messianic Star:a symbol of the early Messianic Christian movement; It consists of a fish emblem intertwined with a Star of David, symbolizing the harmony of Jewish and Christian beliefs, the foundation of the Christian faith and the shared values of the Old and New Testimonies.